(Press release Environment Agency:) London, 8 November 2018 - The Environment Agency has completed a vital new Teesside flood scheme which benefits local residents and businesses and provides a significant boost to local wildlife. Costing almost £16million, the Port Clarence and Greatham South project has increased flood protection to Port Clarence residents from the River Tees and Greatham Creek while also creating new habitat the size of over 90 football pitches for local wildlife. Throughout the project the Environment Agency has worked closely with the RSPB and Natural England to create a scheme which maximises benefits for the internationally designated habitat which includes rare birds as well as seals. The new habitats also feature both a brand new bird hide and seal hide to give nature-lovers a close-up view of these stunning local species. Combined with flood defences that were completed at Port Clarence in 2015, the project reduces the risk of flooding to 350 homes and 32 businesses in Port Clarence and the Seal Sands Industrial Complex. The project therefore helps keep the local community safe from events like the 2013 floods while also providing stability for jobs and industry and safeguarding the future of the natural habitat in the Tees Estuary. The first phase of the project, which saw new flood defences built at Port Clarence to reduce flood risk from the River Tees, was finished in December 2015. 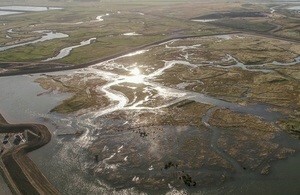 Phase two saw the Environment Agency raise existing flood embankments along Greatham Creek, to reduce the flood risk to Port Clarence and land which is south of the Creek. They also built new flood defences to the north of RSPB Saltholme Nature Reserve, and breached the old flood defence to allow the new area to fill up with water, creating more than 36 hectares of new inter-tidal habitat. In addition, 12 hectares of freshwater habitat was also created as part of the project.